In 1891, the doors opened to a new theater in Mount Vernon, Ohio, constructed by Dr. Ebenezer Woodward. Today, it is America’s oldest authentic 19th Century theater, a relic and a gem, all rolled into one. The building, known as the Woodward Opera House, is listed on the National Register of Historic Places and it is a key element of the Downtown Mount Vernon Historic District. During its heyday, the Woodward hosted many top shows and performers. The most famous of these was local musician Dan Emmett, known for the song “Dixie,” as well as “Turkey in the Straw,” and other old-time tunes. The Woodward was also famous for showing the first motion picture in Knox County back in 1897. The statuesque structure stopped being used for performances in 1921, but thanks to a dedicated group of local residents the theater is getting a breath of new life. 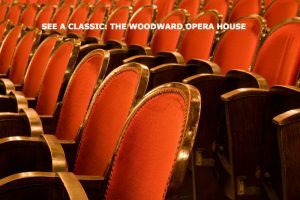 The Woodward Development Corporation was formed in 1997 with a mission to restore the Woodward building to its former glory, incorporating performance space and a place for the community to come together. Local and regional musicians, dance, and theater groups are already utilizing the space. Once the final restoration is complete, the town hopes to secure more local, regional, and even national bookings, making history all over again. Tours are available for those wishing to see the work in progress and learn more about the restoration project. Just contact the theater to set up a date and time for your tour. Due to the number of stairs, the organization requests that just those over 18 years of age go on tour. Mount Vernon is just 15 miles southwest of Danville, so it’s an easy morning or afternoon trip. Plan to spend several days with us at White Oak so you can take in this and other wonderful local sites—and still have time to relax by the fire at the Inn, of course!